Nice private,semi secluded cabin for all your getaway needs. Be it a vacation, honeymoon, or just a few days to get away from the everyday hustle, this cabin is for you. Just breathe the fresh air and relax. Just a half mile from a park with creek ,picnic tables and bathrooms. Located in the heart of Maggie Valley, in the Smoky Mountains, we have everything you need to make your stay relaxing and enjoyable as possible. Just a couple minutes drive to downtown Maggie Valley, where shops and restaurants are located at your fingertips. Nestled in the quiet woods and just a short drive from the Blue Ridge parkway and the Great Smoky Mountains National Park, where you can touch, smell, and see all that has been created for mankind. A perfect vacation retreat for all Motorcycle enthusiasts, as there is plenty of parking for your Bikes and trailers. I grew up in Georgia until age 12. From then until now, I reside in SWFL. I always enjoyed the seasons and Maggie Vally tugged at my heart! So when Hibernation Hollow become available, I knew it was for me. Hibernation Hollow has the best of everything. Spacious, yet cozy. Nature, ammonites, great neighbors & beautiful views from every room. When I sat on the porch, looked around and saw all the nature, views, & friendly community I knew this was the perfect cabin. Breakfast nook on screened in porch for outside eating. Just a short drive to ski resort. Perfect cabin! Loved every second there! We just spent the week here, the first week of January and I cannot say enough great things about this cabin! Everything was fantastic! The place was spotless, the furniture and beds were so comfortable! Very well-stocked with towels, pillows, blankets and pretty much all the other necessities in regards to bathrooms and kitchen. It is a very spacious home! There were a total of three humans along with our two toy poodles. And all five of us enjoyed every moment that we were there. It was very easy to get to the house, maybe a half mile off the main street. Tons of room for parking and in a great neighborhood! And I would also like to note that Vicki, the owner, is the best! She loves her house and cares about those who spend time there. Thanks again for everything and I highly recommend this home! Our family of six with children ranging from age 10 to 20 found the cabin very comfortable and spacious. The kitchen was stocked with plenty of dishes and cooking utensils. The hot tub was a hit, and the close proximity to Asheville allowed us to go enjoy the Pinball Museum and the Asheville Science Museum. Planning to enjoy the Maggie Valley Christmas Tree lighting before heading home. So glad your family enjoyed the cabin and surrounding areas. Always looking forward to my guests returning again. Thank you. Had a GREAT TIME at Hibernation . Vickie bent over backwards to be sure our stay was good. The cabin was very clean and comfortable. While we had a tough time working the TV, we were finally able to figure out. Hot Tub was Great. Would definitely rent again. We understood about the fireplace, but would have been better if it were working. Thanks for letting us use your cabin. Very nice experience. We are 5 recently retired adults. (2 couples and 1 single). Cabin was well supplied for all our needs. Quiet neighborhood.. morning coffee on porch was very relaxing. Wanted to visit Gatlinburg and Biltmore in Asheville during our stay so, picked Maggie Valley as kind of a central location. Picked this site as it was motorcycle friendly with a huge flat parking area. Owner, Vicki, called before we arrived to advise if we needed anything. Very sweet and pleasant lady. I will return. Thanks Vicki! Thank you very much for your review. Looking forward to you returning. The cabin was very clean, and spacious. The hot tub was amazing. I am so thankful for the pet-friendly environment. 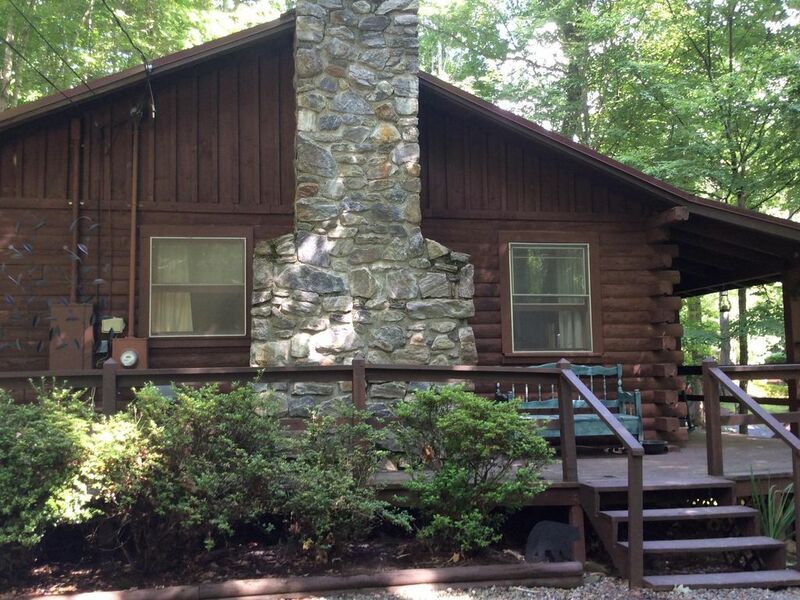 The cabin is literally right in the middle of Maggie valley, less that 5 minutes to town. The owner was very nice and easy to work with. This was the first of many vacations here. So glad you enjoyed your stay. Looking forward to you coming back. The different seasons make each return different too. The leaves are beautiful in the fall and the snow is breathtaking in the winter. My family had the best time here......house is great and has everything you need. The owner is very easy to work with and made our stay the best. Close to Cherokee so we went tubing had a great time. The house is in the shade so it was very cool. I enjoyed the weather up there we even cut off the air and raised the windows a few days. I will use this location again. So glad you had a great time at the cabin and look forward to you returning.